The compact T6 IVC center-connection radiators bring new flexibility to heating and feature innovative design, high quality workmanship and high heat output. This dual panel, double convector radiator offers the advantage of a standard 2" central connection and the standard 4 corner connection options. Pre-planning and installation are greatly reduced, saving time and money. The new T design allows installers the flexibility to connect to the most convenient location. The T6 IVC is a ready-to-install radiator and comes with standard mounting brackets. Compression fittings for 1/2 inch copper tubing or 1/2 PEX adapters and TRV Head are not included. To ensure your radiators arrive safely, larger/heavier radiators may be shipped on a pallet and thus are not eligible for free shipping. Shipping calculations on larger/heavier radiators may need to be adjusted after your order due to oversize shipping & fuel surcharges. Call 866-361-4782 if you require a more accurate shipping quote. 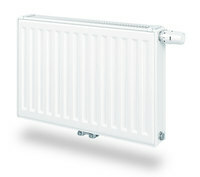 All sales of Myson radiators are final, returns are not accepted.